The art of Japanese Zen gardens. Zen, bonsai, suiseki, bonkei, and saikei are all terms you may recognize. Different thoughts, feelings, and places, are represented in a simple setting by elements of water, stones, and trees. Professionals of these art forms use their skills to seek relaxation, and truth in thought. Not just aesthetically pleasing, Japanese gardens are created with a great deal of conceptual method behind them. However seemingly complex, a beautiful, unique, and serene space can easily be created by simply learning the basics. There are many subcultures of Japanese gardening. The art of bonsai cultivation involves raising and pruning a miniature tree into an artistic shape. Stone appreciation is a simple idea meant to invoke thought and peace using the natural contours of a rock. However, it is the ideas behind Zen philosophy that shape these ideals. This philosophy is a form of Chinese Buddhism that plays an important role in both Japanese culture and gardening. It values simplicity, attributing spirituality to surroundings through direct experience, and mental awareness. Monks are deeply thoughtful and influential in their teachings by being aware of the world around them. They craft dry gardens that pose a question, to which everyone has a different answer. Jenny Hendy, botanist and author of Zen in your Garden: Creating Sacred Spaces, explains how people may see rocks and moss symbolizing mountains and islands, or the stone-raked contours symbolizing the ripples in the pond. “Because the development of religious thought and the style of gardens are inseparable, it is likely that garden design encourages thought and helps move it in new directions, towards the Zen approach,” muses designer and author Erik Borja in Zen Gardens. Bringing the calm, relaxing style of a Zen garden into your own home is as simple as buying a bonkei (a dry miniature garden with white sand and stones). The Zen garden is “designed to be gazed at from a fixed point — that is, from the raised, covered passage of the house — it is seen in its entirety and so transforms the way we see it,” says Borja. After deciding on the focal point, the placement of other elements is crucial. One must try not to overwhelm the senses; there should be a balance between elements. The focal point could be a rock grouping, a temple, a pond or stream, or a sculpted tree. Accents to the focal point could be rocks, stone pathways, water sounds, stone-rivers, and moss. Backdrops, screens, walls, gates, and entranceways should also be considered. 15-year-old Shimpaku Juniper in slanted bonsai style. Trees, and the shapes of their branches, are frequently used to block out other elements, creating a wall that secludes the garden. A tree in a full-sized Japanese garden could be designed in a Bonsai style, as it is pleasing to the eye. Multiple full-sized trees, however, can often be overbearing and divert attention away from the focal point. 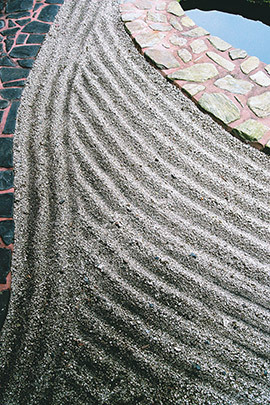 There are a number of factors to consider when viewing a Zen garden. “The design should promote clean lines and no unnecessary flourishes,” explains Hendy. The senses are to be soothed, not stimulated. 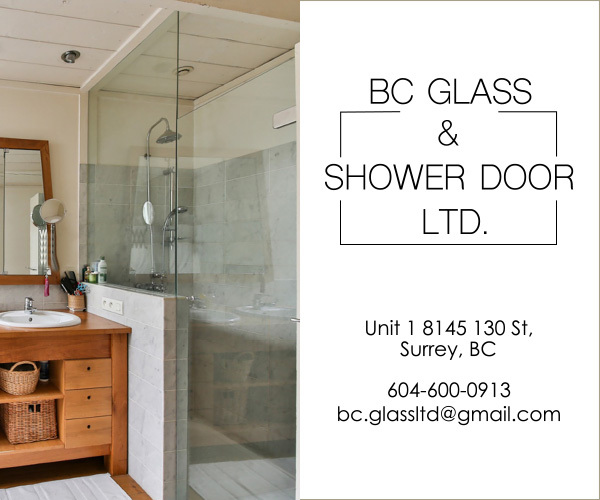 “It is a place that encourages a contemplative state of mind,” explained Kieran Egan, a Simon Fraser University professor and author of Building My Zen Garden. “Western gardens overwhelm the senses with massive amounts of flowers, colours, and pretty things. 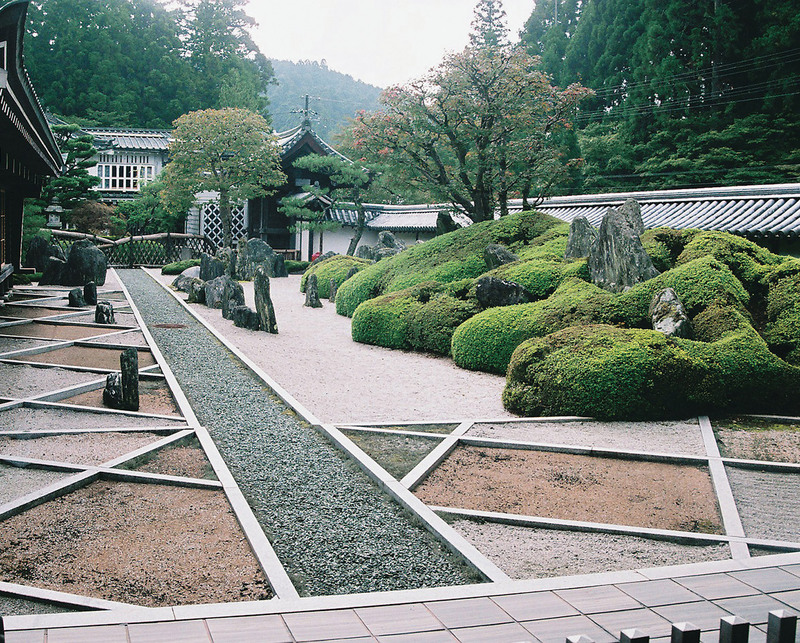 It’s quite vulgar.” A Japanese Zen garden should draw on subtle and natural shades of green, grey, and blue. 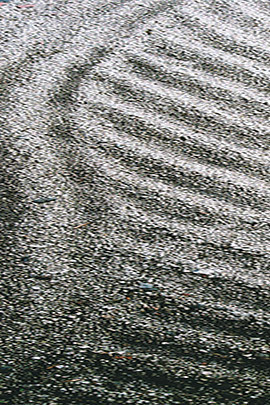 “According to the ancient religion of Shinto, the gods manifest themselves in certain natural places or things, including mountains and rocks, which are therefore regarded as ‘divine bodies’ (shintai),” author François Berthier explains in his book Reading Zen in the Rocks (translated by Graham Parkes). “Stones are the skeletons on which gardens are supposed to be built. The placement, style, and size all play an important part in invoking emotions of peace and harmony with plants and other planted material,” stated Bruce Miller, a stone-hobbyist. There is a “preference for stones that [are] more suggestive than explicit, more natural and irregular than artificial and symmetrical, more austere, subdued, and weathered than ostentatious, colourful, bright, and new. Reduced to its bare essentials, the stone [becomes] a means of spiritual refinement, inner awareness, and enlightenment,” Vincent T. Covello and Yuji Yoshimura describe in The Japanese Art of Stone Appreciation. There are many different styles of bonsai, and it is important to choose a style that suits one’s taste and needs. The size of the potting, the shape of the branches, the trunk, and the roots all contribute to the style. 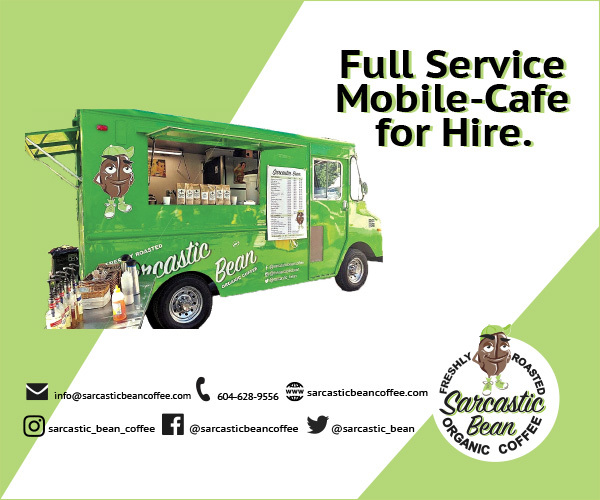 The five basic styles are straight, curved, slanted, semi-cascade, and cascade. A straight trunk can also be called formal upright, where the tree is coached to grow in its natural fashion. Informal upright, in contrast, involves wiring the tree trunk to display a slight curve or twist. 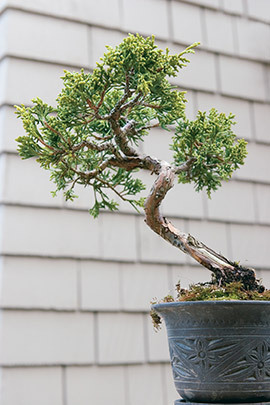 Slanted bonsai may have a subtle lean or a windswept look. Semi-cascade styles represent the trunk ascending slightly, and then succumbing to gravity. Cascade, like semi-cascade, symbolizes a tree growing on a steep slope, but with a much more dramatic descent. Most plantings have exposed, or semi- exposed, roots. The amount of root showing reveals the power and stability of the plant. According to the book Bonsai by Susan Lang, “Bonsai can range from a few inches to about four feet in height.” When a tree exceeds four feet, it can still possess a bonsai style, but it is no longer classified as a miniature specimen. Multiple bonsai in one pot often come in groups of three, five, or seven. When beginning bonsai cultivation, soil choice and watering are important to consider. A coarse soil that will not retain too much water should be used to avoid rotting roots. Consequently, due to this coarse soil, the bonsai will need watering regularly. “Bonsai is made of two parts, the horticulture and the artistic side. You should create more artistic shapes. But you need to know how to grow bonsai, that’s the horticulture part. Know the trees; when you cut the branches wrong, it makes [the tree] weak and it dies,” said Yamaura. Bonsai can be planted with rocks, moss, and representations of water; the combination of these elements creates a miniature landscape called saikei. Saikei represents a natural scene and was created by Toshio Kawamoto to describe his school of bonkei. Bon is the acceptable word for tray, on which a bonsai is displayed. Sai is translated as the tree or other planted greenery — a living vegetative material. Kei is the Japanese term for landscape. As with a full-sized garden, there must be a focal point, trees, rocks, and an aesthetically pleasing scene in the saikei. Positive and negative space, sand and soil, and stones and trees are all represented in a small tray. Kawamoto makes it clear in Lew Buller’s Saikei and Art that saikei are not bonsai; his living landscapes contain all elements to represent a full landscape with water, plants, and the roots and soil above the rim of the tray. The Dr. Sun Yat-Sen Classical Chinese garden offers sanctuary in the heart of Vancouver. Admiring natural and timeless ideals in Japanese furniture.